Several commentators have been left disappointed by Modi’s – and India’s – handling of international relations in the past two years. The record shows otherwise. Two years ago today, Narendra Modi took the oath of office as India’s 14th prime minister. Among his first decisions as head of government – in fact, it was set in motion even before the formal start of his tenure – was an unconventional act of diplomacy: inviting eight foreign leaders of neighbouring countries to attend his inauguration. While many commentators claimed before his election that Modi would be a nationalist hardliner, a foreign affairs novice, or simply more of the same on external affairs, the prime minister instead proved more active and (perhaps less surprisingly) more pragmatic than many had expected. In two years, Modi has displayed an instinctive understanding of power in the conduct of world affairs, and he has also benefited from being less politically hamstrung than his predecessor Manmohan Singh, with whose worldview he in fact shares much in common. A highlight of Modi’s first year was his outreach to the United States. In September 2014, Washington rolled out the red carpet for a leader it had once publicly shunned, and Modi reciprocated by inviting Barack Obama to India’s Republic Day celebrations, a first for a U.S. president. But beyond normalising and enhancing relations with the US, Modi’s international priorities were quickly made evident. Within his first year, he embarked upon state visits to India’s immediate neighbourhood, three crucial Indian Ocean island countries, important Asia-Pacific powers (China, Japan, and Australia), and eventually Western Europe. Modi’s second year followed in much the same fashion, with a ground-breaking visit to Bangladesh, a swing through Central Asia, a long overdue visit to Afghanistan, and a renewed focus on the Middle East or West Asia. It also included a surprise stopover in Pakistan, a trip no Indian prime minister had managed since 2004. In addition, Modi has in his first two years played host in India to most of the world’s top leaders, including those of the United States, China, Russia, France, Japan, and Germany. He also hosted a landmark India-Africa Forum Summit last November that involved 41 heads of state and government. 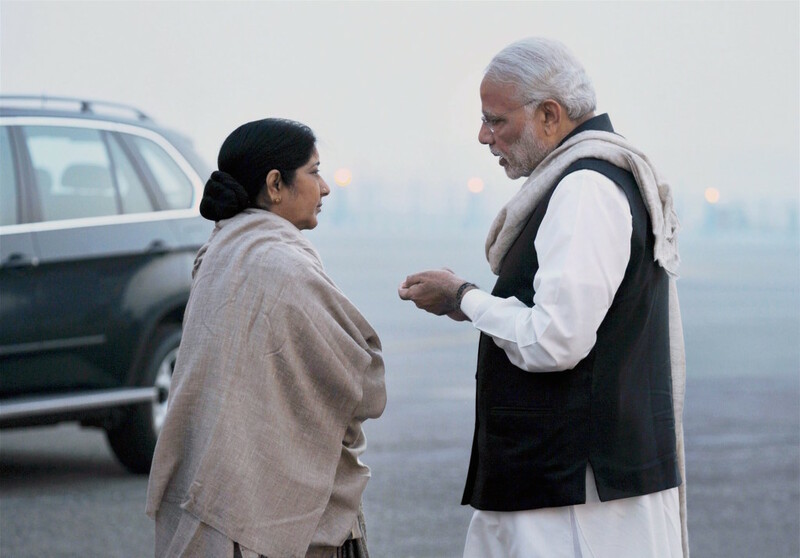 Despite this flurry of activity, several commentators have been left disappointed by Modi’s – and India’s – handling of international relations. My Brookings India colleague W.P.S. Sidhu has pointed to a lack of strategic vision, and describes Modi’s various foreign policy initiatives – such as Neighbourhood First and Act East – as “vacuous.” While commending the prime minister’s sound instincts, initiative, and energy, former foreign secretary Shyam Saran has lamented the lack of an overall national security strategy and criticised the priority granted showmanship over substance. Meanwhile, Rajesh Rajagopalan of Jawaharlal Nehru University has expressed disappointment with the lack of new ideas and synergy and his colleague Happymon Jacob has faulted New Delhi’s bullying and poor imagination for bad relations with its neighbours. Advancing Indian representation and leadership on matters of global governance. These are the yardsticks against which the international activities of this government – or, for that matter, any Indian government – should be measured. In each case, it is important to assess the progress made, the setbacks experienced, and the long-term or structural challenges that will continue to confront India. The approach called ‘Neighbourhood First’ – a phrase adopted by the Indian government – is meant to indicate four things. The first is New Delhi’s willingness to give political and diplomatic priority to its immediate neighbours and the Indian Ocean island states. The second is to provide neighbours with support, as needed, in the form of resources, equipment, and training. The third, and perhaps most important, is greater connectivity and integration, so as to improve the free flow of goods, people, energy, capital, and information. The fourth is to promote a model of India-led regionalism with which its neighbours are comfortable. The newfound diplomatic priority on the region is evident in Modi’s visits to all of India’s neighbours – barring The Maldives – as well as regular leadership meetings in India and on the sidelines of multilateral summits. India has also become more forthcoming in providing support and in capacity building, whether concluding its biggest ever defence sale to Mauritius, or in providing humanitarian assistance to Nepal or Sri Lanka. With Bangladesh, the completion of the Land Boundary Agreement, improvements in energy connectivity, and steps taken towards accessing the port of Chittagong have all been crucial developments that help to set a positive tone for a region long defined by cross-border suspicion and animosity. India’s focus on connectivity is also gradually extending outward, whether to Chabahar in Iran or Kaladan in Myanmar. Although India will continue investing in the South Asian Association for Regional Cooperation (SAARC) as an institutional vehicle, it has also expressed a willingness to develop issue-specific groupings that are not held hostage to consensus: a “SAARC minus X” approach. Two examples of this are the Bangladesh-Bhutan-India-Nepal (BBIN) grouping – meant to advance motor vehicle movement, water power management, and inter-grid connectivity – and the common SAARC Satellite, which India has decided to proceed with despite Pakistan’s objections. These concerted efforts have so far had mixed results. Bangladesh and Bhutan have clearly been positive stories for India. Ties with Sri Lanka have proved a mixed bag, despite the electoral loss of former president Mahinda Rajapaksa, who had testy relations with New Delhi. However, President Maithripala Sirisena remains well-disposed and personally invested in better relations with India. The Maldives has proved more difficult. India has continuing concerns about the fate of former president Mohamed Nasheed, although several defence agreements were concluded during the visit to India of the incumbent Abdulla Yameen. The obvious regional outlier has been Nepal, which has been the most vexing foreign policy problem facing the Indian government over the past year. Despite considerable Indian assistance in the aftermath of last year’s devastating earthquake – that reportedly included over 1,700 tonnes of relief material and medical assistance to thousands – Nepal’s constitutional crisis severely set back relations. The crisis was not of India’s making – it was primarily the product of differences between Nepal’s hill elites and the Madhesis – but New Delhi was confronted with a tough choice. Either it could have welcomed a flawed Nepal constitution, knowing that months – perhaps years – of Madhesi agitation would follow, risking escalation that could have damaged Indian interests. Or it had to take some form of action to urge Kathmandu to revisit the more contentious aspects of the constitution, risking the immense goodwill that it had built up over the previous year. After Indian diplomatic entreaties were dismissed, it opted for the latter. New Delhi was guilty of responding late to fast-moving developments, and despite successfully pressuring Kathmandu to amend some aspects of the contentious constitution, it has not been able to overcome continuing mistrust or resolve the remaining constitutional differences. With respect to all of its neighbours, including Nepal, India has taken concrete steps over the past two years to promote goodwill and deepen economic and social connectivity. But nationalist sentiments in all these countries – often directed against India as the region’s predominant power – will continue to present a challenge. Anti-Indian sentiments will also, paradoxically, drag India further into these countries’ domestic politics, suggesting that undulating highs and lows in its neighbourhood relationships will now be the norm. Furthermore, for all of India’s neighbours, China is now prepared to step in to provide financial, military, infrastructural, and even political assistance, and act as a potential alternative to India. This new development is something India will have to carefully monitor and appropriately respond to – as it has in recent years – particularly if Indian security interests are seriously compromised. As the status quo power in its neighbourhood, India will have to constantly play defence in its own backyard. A second major objective of India’s foreign relations has been to leverage international partnerships to advance India’s domestic development. This includes improving technological access, sourcing capital, adopting best practices, gaining market access, and securing natural resources. In these respects, a truly accurate assessment will only be possible in the years to come, given the lag time between initial agreements and results. That being said, some of the short-term indicators show promising signs. Greenfield foreign direct investment (FDI) has already seen a jump – with India surpassing China – although how much of that can be attributed to diplomatic efforts is uncertain. Some new international collaborative efforts, such as Japan’s ridiculously low-cost loan for a high-speed rail line, have immense potential and, like high-profile Indian metro and airport projects in the recent past, might be replicable. The recently amended tax treaty with Mauritius is but one example of how diplomacy can be used to benefit both investors and the government, and potentially increase India’s tax base. The extension of lines of credit to Africa and Iran promises to increase business opportunities for Indian firms. And securing buy-in from major Silicon Valley corporations in increasing Internet access in India marks another effort at advancing national development. In this respect, however, the greatest challenge will be in tying international agreements to domestic agents of change, whether specific ministries, the private sector, or local actors. Securing international agreements is hard enough; using that to spur developments at home is an altogether more challenging proposition. Such complications are most obviously manifested in trade policy, which has more immediate implications for domestic constituencies, and in defence, where the government is struggling to balance the desire for defence indigenization, commercial viability, and an under-performing public sector-led defence industrial complex. The overall trajectory for India’s development is certainly positive, and the diplomatic momentum has clearly increased. But India still has a mountain to climb to fully harness external inputs to advance economically, socially, and technologically. This will be a decades-long project. When Modi rhetorically replaced two decades of India’s ‘Look East’ policy with ‘Act East,’ the purpose was to show greater intent in realising what had long been an aspiration for India: to become an integral part of Asia. The greater urgency implicit in the shift in terminology is largely an outgrowth of Indian concerns regarding China’s rise and the upsetting of Asia’s delicate balance of power. In addition to the development of military and dual use Chinese infrastructure in India’s neighbourhood and the Indian Ocean, India’s concerns are three-fold: the risk of Chinese assertiveness on the disputed border, the possibility of Chinese primacy in the Indo-Pacific region, and an uneven economic playing field. After an ill-timed Chinese incursion during Xi Jinping’s 2014 visit to India, the disputed Sino-Indian border has proved reasonably stable over the past year. China has remained preoccupied in more politically sensitive disputes over the South and East China Seas with the likes of Vietnam, the Philippines, and Japan. India-China border negotiations have been continuing apace, but a breakthrough is highly unlikely. The development of border roads on India’s side remains an uphill task, as is preserving a military balance, particularly in terms of air superiority. The diplomatic conditions are currently favourable for India to retain its military advantage. But while progress on the border has been steady, it has also been slow. In terms of the broader strategic context in Asia, India’s ‘Act East’ policy has three distinct facets: institutional, commercial, and security-related. The first has largely been successful – mostly as by-product of two decades of Indian economic growth. Barring the Asia-Pacific Economic Cooperation (APEC) forum, India has integrated into Asia’s multilateral networks, most notably the apex East Asia Summit. However, the conclusion of the Trans-Pacific Partnership agreement, the largest trade pact in history, threatens to affect India’s commercial ambitions in the region, possibly costing India as much as 0.1 percent of GDP. Unfortunately, the Indian response to the development of new trade blocs has too often been defensive. Rather than remain in denial, India will have to rethink how to adapt to the new trade order. Better trade with Southeast Asia will also require developing overland connectivity in India’s northeast, Bangladesh, and Myanmar. Expanding India’s port capacities and relaxing constraints on shipping are necessary first steps that are now being taken. But beyond institutional and commercial changes, the greatest departure over the past two years has been on the security side. Not only have India and the United States been able to articulate a Joint Strategic Vision for the Asia-Pacific and Indian Ocean Region, but India has become far less reluctant to embrace “minilateral” or “plurilateral” security arrangements and political consultations. This includes effectively elevating the Malabar naval exercises into a trilateral India-U.S.-Japan initiative, and commencing an official India-Australia-Japan dialogue. Deepening security partnerships with other Indo-Pacific states that share India’s concerns remains a priority, but is also largely subject to their own vacillations and political processes. Finally, bilateral economic relations with China offer a contradictory picture. On the one hand, India seeks to be a beneficiary of China’s attempts at rebalancing its economy, and has become a destination for Chinese investment. The last two years saw a significant jump in Chinese foreign direct investment (FDI), from Rs. 767 crores in 2013-2014 to Rs. 3,066 crores a year later. In fact, those two years alone have accounted for over 70% of Chinese FDI ever into India. But China’s old economic habits are proving hard to kick. Barriers to entry for Indian software companies remain, even as China’s high tech sector comes into its own. And India shares continuing international concerns about China’s dumping of goods. To date, India’s Act East policy has added greater urgency to its earlier aspirations. Certain aspects, such as institutional participation have been more successful over the years, and others such as bilateral and ‘minilateral’ security cooperation have seen discrete recent improvements. India’s primary challenges will lie in preserving the military balance on the disputed border with China, and integrating itself into the region’s commercial networks. This will require placing a greater priority on improving border infrastructure, on overland connectivity to Southeast Asia via Bangladesh and India’s Northeast, on port and shipping infrastructure at home, and on developing an understanding of the implications of TPP for India. Only then can India really come into its own as an Asian power. Pakistan’s relative importance for India has waned significantly over the past two years. The development of nuclear weapons by both countries has ensured an uneasy peace, while Pakistan – despite Indian entreaties – has refused to open up economically. Terrorism by entities based in Pakistan, and supported by the country’s military and intelligence agencies, continues to be directed at India, although certain measures have helped reduced the number of infiltrations and severity of attacks. Nonetheless, Pakistan remains a political hot button issue, and India-Pakistan relations still dominate media coverage and political discourse. None of the last few Indian governments have been under any illusions about Pakistan. Terrorism emanating against India by entities based in Pakistan and supported by elements of the state remains a top priority; one need only look at every recent statement made by India with Pakistan to see the prominence given to that issue. But India’s options are also limited. For all the talk about retaliating against Pakistan, particularly militarily, such steps risk an escalation to the nuclear level. Containing Pakistan is not a possibility either. India’s economy is not yet large enough, it is limited by geography, and Pakistan continues to find support in the Gulf, the United States, and China. Any suggestion of India’s responding “in the same coin” is also unnecessary; Pakistan is doing a perfectly good job destabilizing itself. Nor can Pakistan be ignored. Indian passiveness is exactly what Pakistan wants, for it would invite third-party intervention, something a rising sovereign India would naturally resent. After several attempts at setting the terms of engagement over the past two years, India has had to settle upon a two-track policy. The first is to continue keeping lines of engagement open, as long as terrorism tops the agenda and that dialogue is strictly bilateral in nature. This has resulted in a peculiar ping-pong. Inviting Nawaz Sharif to Delhi in 2014 resulted in Pakistan trying to involve the Hurriyat, a coalition of Kashmiri separatists, and Pakistani shelling along the Line of Control with India. The 2015 Ufa Declaration was heavily criticized in Pakistan and led to Islamabad calling off the national security advisor talks under rather farcical circumstances. Modi’s Lahore stopover in December 2015 was followed soon after by the Pathankot attack. And the response to India allowing Pakistani investigators access to the Pathankot site was Pakistan producing an alleged Indian spy, whom India insists is an innocent former Navy officer kidnapped from Iran. The pattern is clear: India has repeatedly tried to renew talks in good faith, only for elements in Pakistan to make brazen attempts at sabotaging the process. While frustrating, the process has created considerable diplomatic space for India – much as Atal Bihari Vajpayee’s Lahore trip enabled a bolder response to Pakistan’s 1999 Kargil incursion. More importantly, India’s constant willingness to engage has kept the United States and others from interjecting themselves in the region. The government has not been content with simple bilateral engagement, but has also had to take countermeasures and steps to delegitimize state support for terrorism. New Delhi’s critical response to the U.S. decision to supply Pakistan with F-16s and prime ministerial visits to Saudi Arabia, the United Arab Emirates, and Afghanistan have all been part of an attempt to isolate Pakistan, to slowly compel its deep state to reconsider its priorities. It is unrealistic to expect that the United States or Saudi Arabia will change their Pakistan policies overnight, but both now have the ability to ‘de-hyphenate’ their subcontinental relationships. Of greater concern in this respect is China’s decision to go forward with the ambitious, multi-billion dollar China-Pakistan Economic Corridor. While India has expressed its concerns, dissuading Beijing from this path will be a severe challenge; after all, much of China’s historical support for Pakistan has been driven by its desire to balance against India. Modi’s efforts with Pakistan have not yet borne results. A stalemate continues. The only difference now is that India’s Pakistan policy has assumed a certain consistency and that it is playing the chessboard with white, rather than black, pieces, seizing control of the momentum and initiative. The process of both engaging and isolating Pakistan despite repeated provocations will be long, frustrating, and politically unpopular at home. But as long as domestic pressures can be navigated, India’s continuing bilateral engagement with Pakistan, its efforts at internationally isolating it, and its offering a viable alternative model of South Asian engagement remain the only real prospect for resolving the Pakistan problem on India’s terms. India is rising in a world system that has been largely favourable to its rise, but one that India was not involved in creating. According to Modi, the present international environment represents a rare opportunity for India, which it must use to “position itself in a leading role, rather than just a balancing force, globally.” India is not yet fully in a position to lead, or set the rules of the international order, but it is taking steps to seek full membership of the most important global governance platforms. India is already a member of the G20, the East Asia Summit, and the BRICS coalition, a testament to its status as a large country with a fast-growing economy. New Delhi also naturally aspires for permanent membership on the UN Security Council. It has also been actively lobbying for full membership of the Shanghai Cooperation Organisation as well as the Nuclear Suppliers Group and Missile Technology Control Regime. These efforts could bear fruit as early as 2016, although there has been opposition from China and – because of the Italian marines controversy – Italy. All the while, India has been trying to bolster its leadership credentials, whether through international relief efforts in Yemen and Libya, reminders of its history of UN peacekeeping, or the public reclamation of its contributions to the World Wars. The successful outcome of the COP21 climate summit in Paris and India’s constructive role have also gone some way towards shedding its reputation as a multilateral ‘naysayer’ and ‘obstructionist’. India has only just recently embarked upon institution building of its own. The International Solar Alliance represents one such effort, as do the Indian Ocean Rim Association (IORA) and BBIN. While India will continue to lobby consistently for inclusion in multilateral security institutions, its presence in the evolving international economic and trade order will still require a clearer articulation of its trade policy, one that gives greater priority to India’s concerns on services, intellectual property, and labour mobility. India has clearly expressed broad comfort with the international order and has actively been lobbying for a seat at the global high table. Learning to lead, however, will be harder. As the prime minister himself has noted, it will require a change in mindsets. A broad overview of the Indian government’s foreign policy, particularly over the past year, ought to clearly show not just a strategic vision, but progress along every one of India’s major objectives. It also reveals some of the frustrations and structural limitations that confront the Indian government, and are likely to confront it for many years going forward. They include the twin spectres of nationalism and Chinese inroads in India’s neighbourhood, insufficient commercial integration with Southeast and East Asia, gaps between diplomatic efforts and agents of domestic implementation, political resistance to engagement with Pakistan, and relative inexperience with leading on matters of global governance. India clearly has to do a much better job remaining vigilant in its own neighbourhood, managing or proactively addressing the domestic political fallout of its Pakistan policy, and better coordinating external outcomes with internal development, all the while raising its ambitions and improving its ability to follow through. What ultimately matters in any assessment, however, is the broad direction or orientation of India’s international relations, and its implementation. This is often at odds with public discourse, which often views developments in isolation and sees facts being used to fit preconceptions. For the television media in particular, Pakistan bashing has become a full-time preoccupation. Of equal concern is the unnecessary polarisation of much of the foreign policy discourse. Politics ought to end at the water’s edge. Unfortunately, the last decade has witnessed more fractious and self-serving discourse on many areas in which there has in fact been remarkable continuity and consensus. The changing media environment is in part responsible for this, as is the behaviour of the opposition parties – both past and present. Evaluating India’s advancement of its international interests will require a clearer assessment of its objectives, the progress made, and India’s continuing limitations. That challenge will be all the more difficult in a fast-evolving and unpredictable world. Dhruva Jaishankar is Fellow for Foreign Policy at Brookings India in New Delhi.